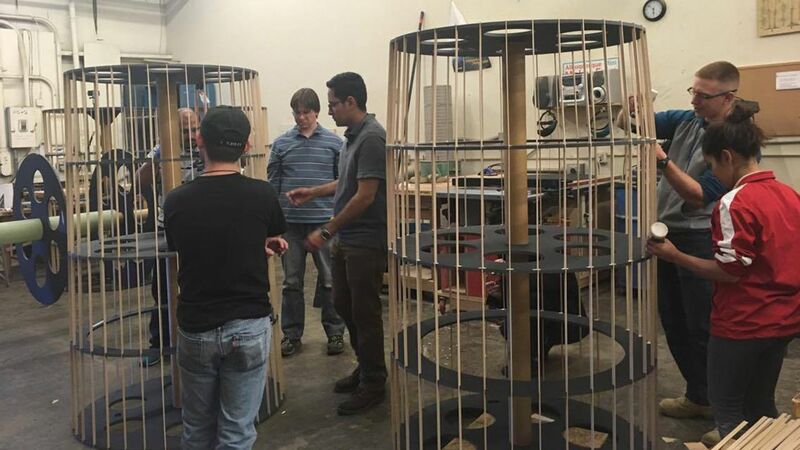 UNM mechanical engineering students will launch the 47', student-built rocket on May 27. The rocket is being built using a semi-monocoque design, common among many different types of aircrafts. A semi-monocoque structure has an internal "skeleton" that provides structure and support to the rocket. Students from the Lobo Launch-Structures team giving Prof. Fernando Aguilar an update on the midsection build. 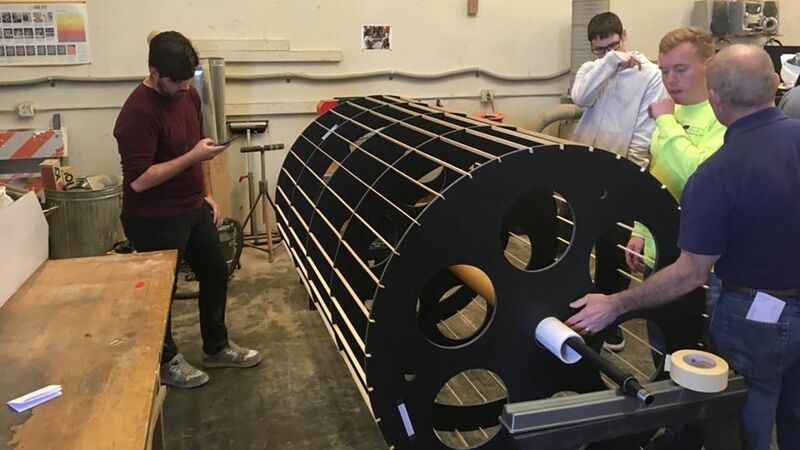 A group of mechanical engineering students at the University of New Mexico are working to build and launch the world’s largest amateur rocket as part of a first-of-its-kind senior design project. 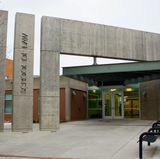 The 400-level, two-semester course is called Rocket Engineering and is taught by Fernando (Doc) Aguilar, a part-time faculty member in UNM’s Mechanical Engineering department. Students wrapping the rocket's midsections with dacron fabric. Unofficially renamed the ‘Lobo Launch’ by students, the class is designed as a way for mechanical engineering majors to get hands-on experience in an aerospace project while finishing up their degrees. 24 students, primarily undergrads, are separated into four different areas (Structures, Launch Rail/Pad, Systems & Propulsion) and are responsible for nearly every aspect of the rocket build. The finished product will stand roughly 47 feet tall, weigh more than 200 pounds and be capable of traveling upwards of 200 mph. 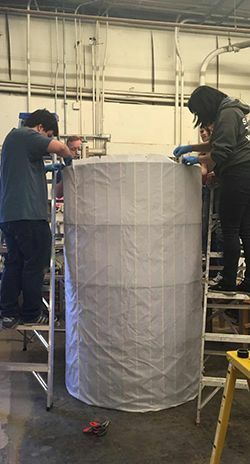 Student organizers estimate the rocket, which is being built using a semi-monocoque design and features a solid-rocket-fuel Cesaroni O8000 motor, will soar somewhere in the range 3000 feet into the sky, releasing a UNM-developed cube satellite before safely returning to earth. It’s an effort that has many of the student engineers both excited and also a little nervous. Sims says while the Mechanical Engineering department has offered a variety of aerospace coursework at UNM over the years, this class is the first to give students this level of hands-on experience. Students say they’ve gotten a lot out of this program and hope it will continue for many years, even growing to the size of UNM’s Formula SAE team. For 20 years, FSAE, also called Lobo Motorsports, has given students the chance to build a Formula One style racecar over the course of four-semesters. And while the Lobo Launch students enjoy seeing the progress of that build, it’s not an area of mechanical engineering they’re necessarily interested in studying. 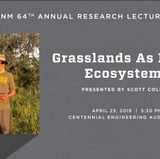 Lopez believes the course will not only benefit UNM students but also Albuquerque and New Mexico as a whole. She says with companies like Boeing, Northrup Grumman and Lockheed Martin in town, providing students with this aerospace experience will make them more marketable to these companies once they graduate, helping keep local grads in the state. 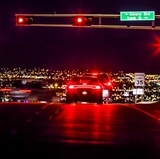 “We have such a big professional aerospace community here in Albuquerque that it makes sense for UNM to have an emphasis on it as well,” said Lopez. Lobo Launch is being funded through a generous donation from a Mechanical Engineering alumnus, Roger Koerner. The students are also receiving support from the Air Force Research Lab and Quelab. So, while they get plenty of engineering experience building the rocket, they also learn valuable project management and networking skills. 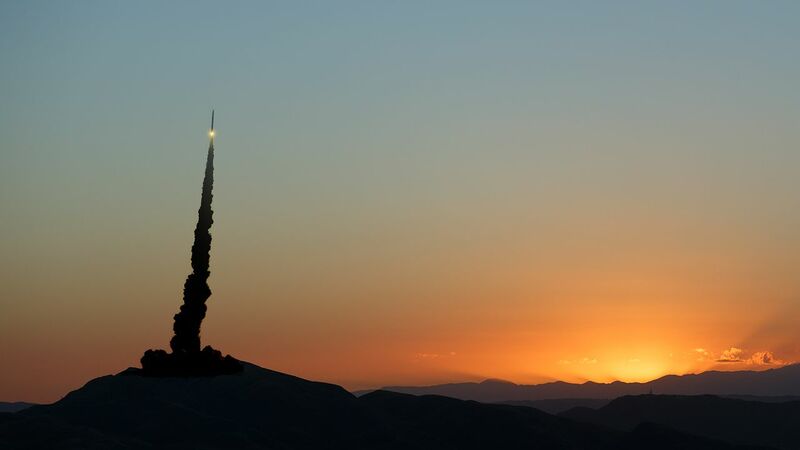 The rocket launch is scheduled to take place on May 27 at 8 a.m. at the Albuquerque Rocket Society launch site, 45th Ave NW, Rio Rancho, NM 87144. Anyone interested in watching the launch is welcome to attend. Right now, the Fall 2017 Rocket Engineering course is open for registration for eligible students under ME 461-001, CRN 57459.